We had planned to take a walk up The Nab today but as the day was forecast to be the hottest day of the week we opted for a leisurely stroll up the lovely quiet valley of Langstrath, at the end of which we would decide whether to carry on up to Angle Tarn and Rossett Pike, or simply turn round and walk back down the Langstrath on the opposite side. Walking up the lovely, secluded valley of Langstrath on an absolutely beautiful morning. 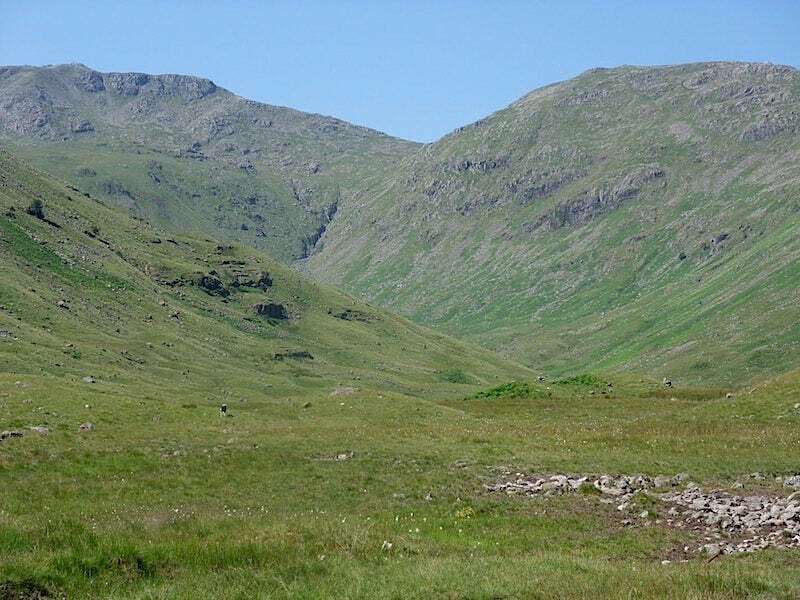 To the left of the shot are the lower slopes of Glaramara and over on the right are the slopes of Eagle Crag and Sergeant’s Crag. 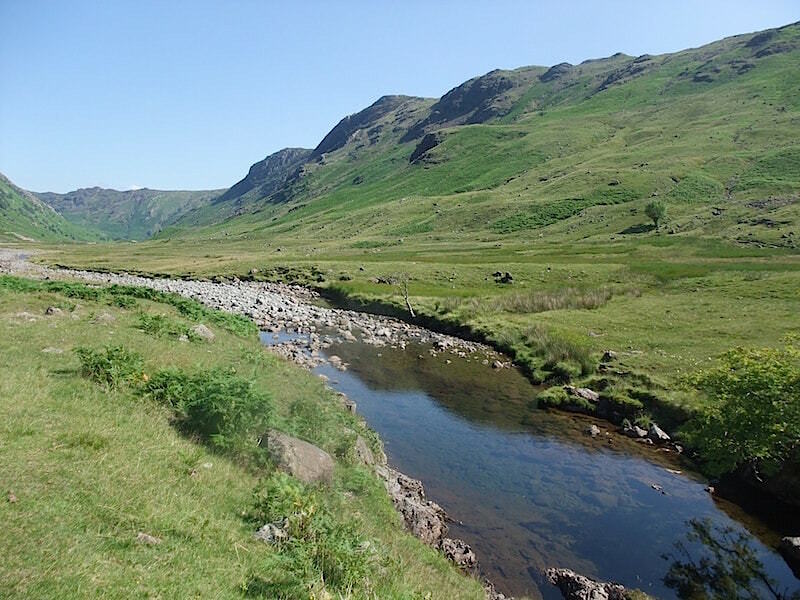 There are lots of lovely places to paddle and bathe in Langstrath Beck, especially on a day like today. The water is crystal clear and it tumbles over rocks and boulders forming falls, cascades and pools of a variety of shapes and sizes. 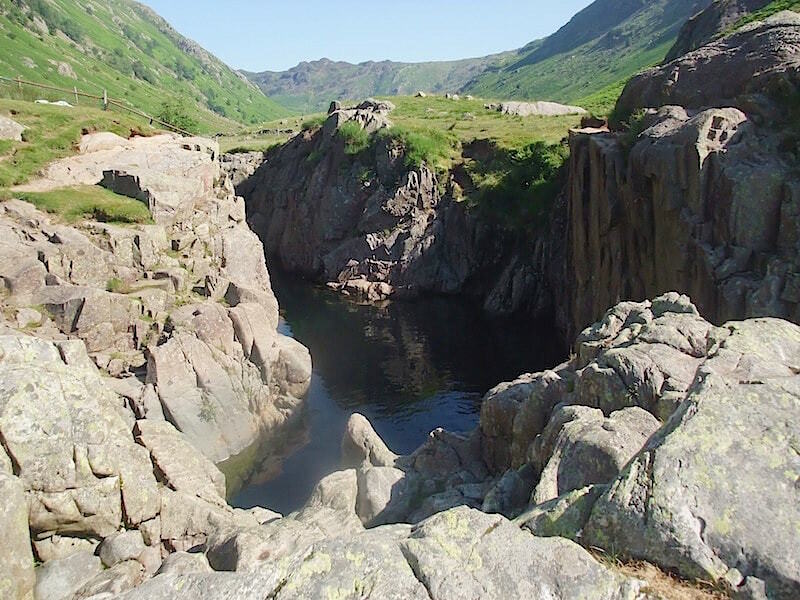 A peep into Black Moss Pot, a popular bathing spot. This early in the day it was deserted but it was a very different scene when we walked back later in the afternoon. 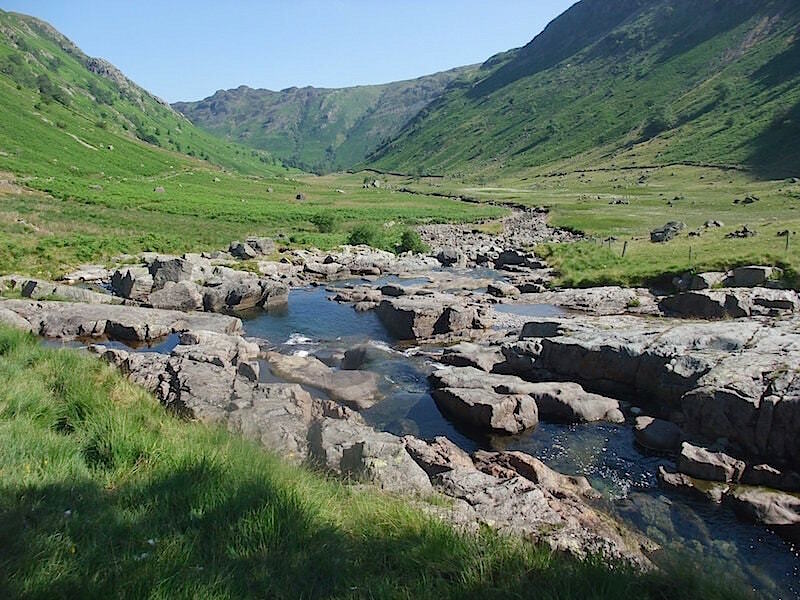 There were people everywhere, families having picnics, young children paddling in the shallower reaches of the beck, while teenagers hurled themselves into the pool from the tall rocks over on the right. 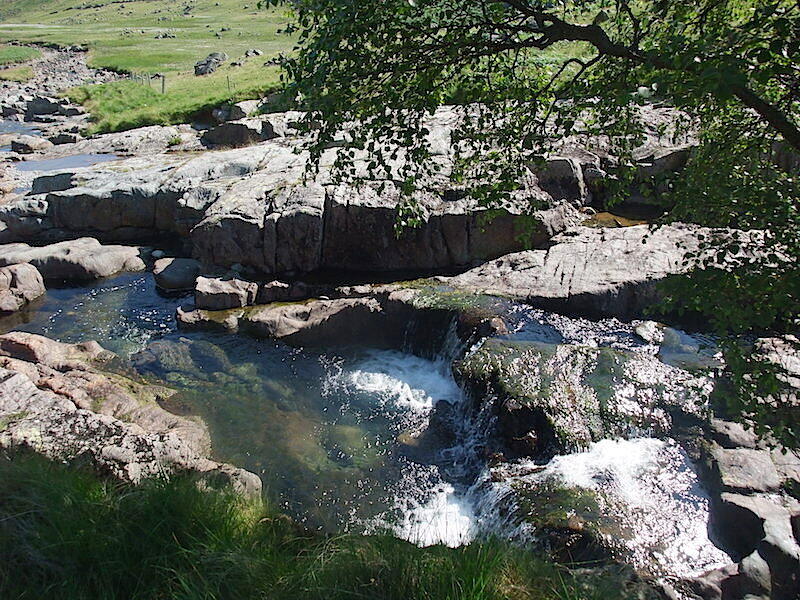 The beck is so very tempting on a hot morning like this, but we resisted temptation and carried on our way. Looking along to the head of Langstrath. The valley is over three miles long and in today’s heat we weren’t in any hurry. 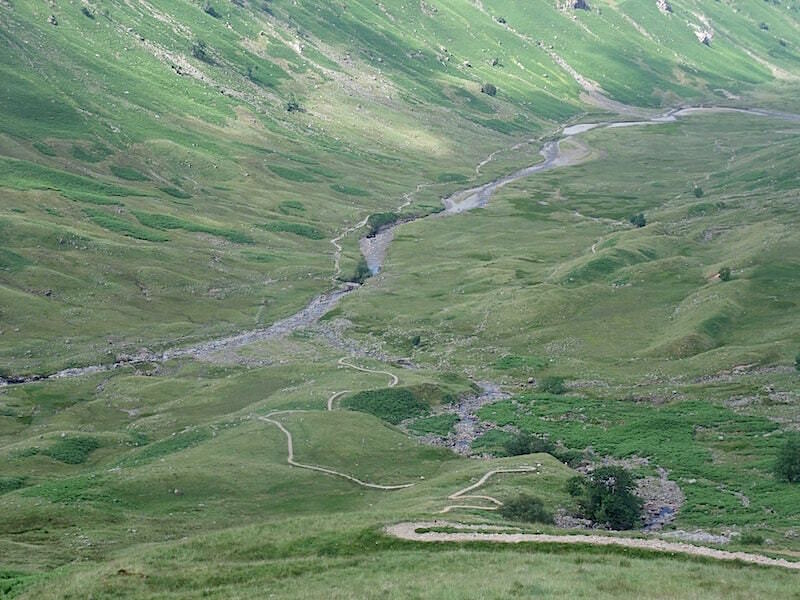 When we reached the bridge crossing which leads over to the Stake Pass route we decided not to cross over and kept to the right of the beck and threaded our way on up to the head of the valley. It was extremely hot so we had lots of stops for drinks and to splash ourselves with water from the beck. 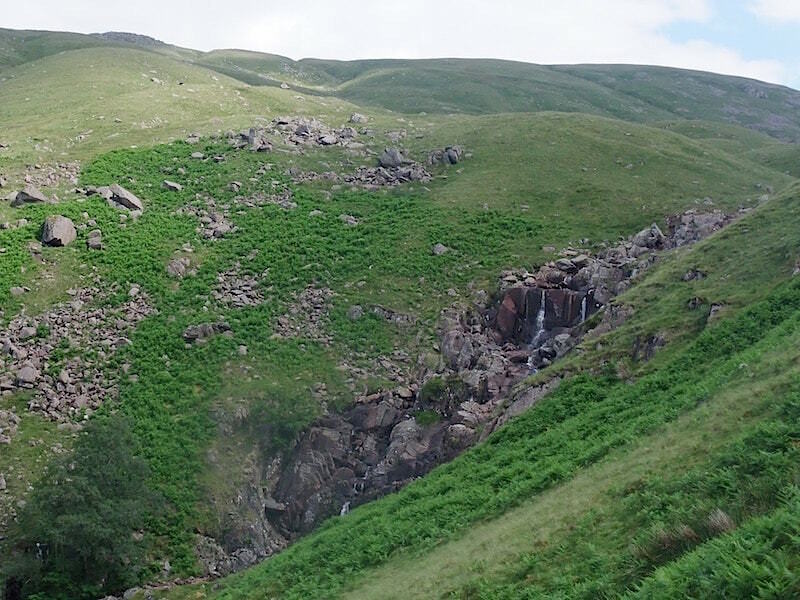 We left the valley and began climbing alongside the beck which flows out of Angle Tarn. 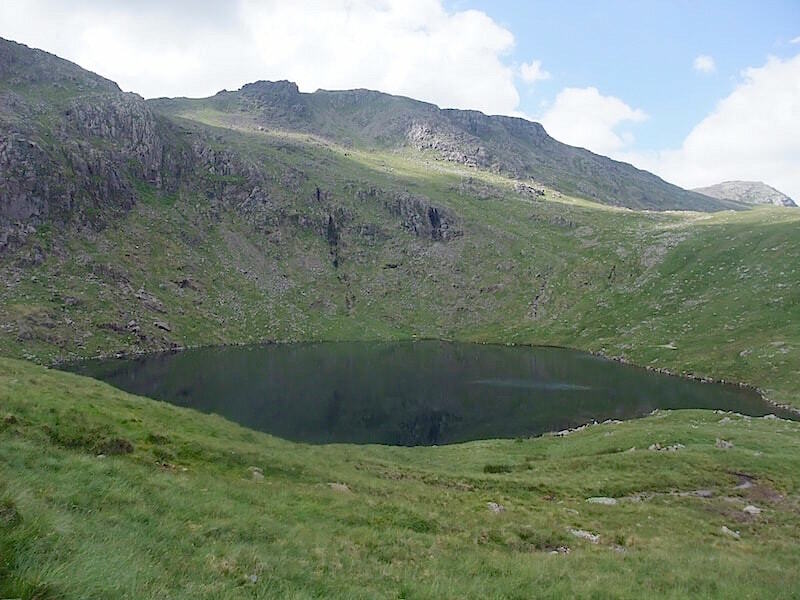 After a lot of huffing and puffing and sweating we reach Angle Tarn where we had a food and drinks stop and, thanks to the arrival of some largish clouds, some very welcome shade for a few minutes with a view of Esk Pike thrown in for good measure. From here its just a short walk up to Rossett Pike summit which is behind the camera. Making our way up to Rossett Pike summit which is just a short distance from the tarn. The view along Mickleden from Rossett Pike, with Lingmoor Fell in the centre. 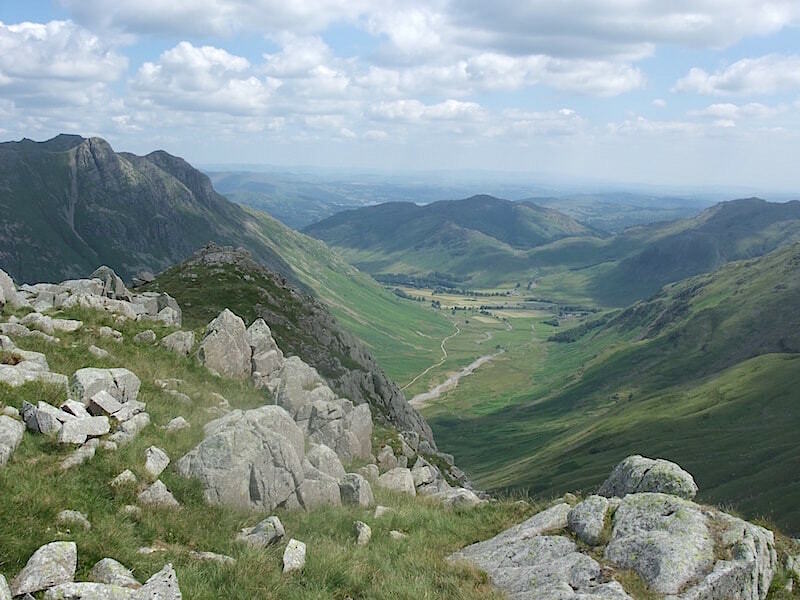 On the left are the Langdale Pikes, and to the right are the lower slopes of Bowfell. 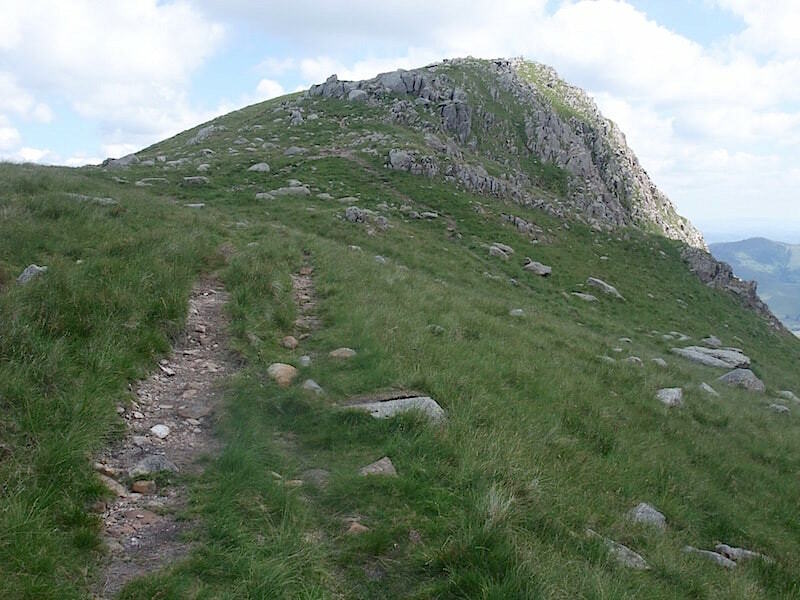 We walked along the Rossett Pike ridge and made our way over to the Stake Pass. 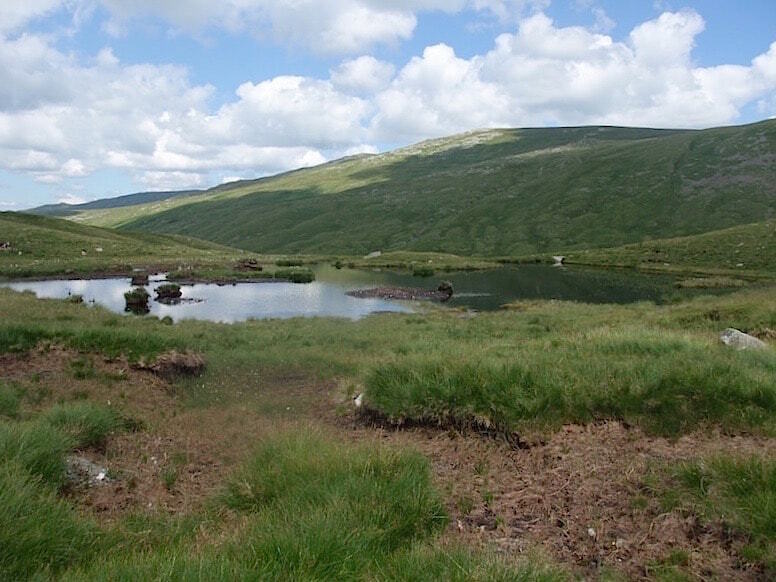 This tarn is shown on the map but it doesn’t seem to have a name, other than the one we call it, the Stake Pass Tarn. How’s that for lateral thinking? As we crossed over we were followed by a young man and woman who caught up with us when we stopped by the tarn and asked for directions. They wanted to go on to Pike O’Stickle and Harrison Stickle and then back down to the Dungeon Ghyll car park. 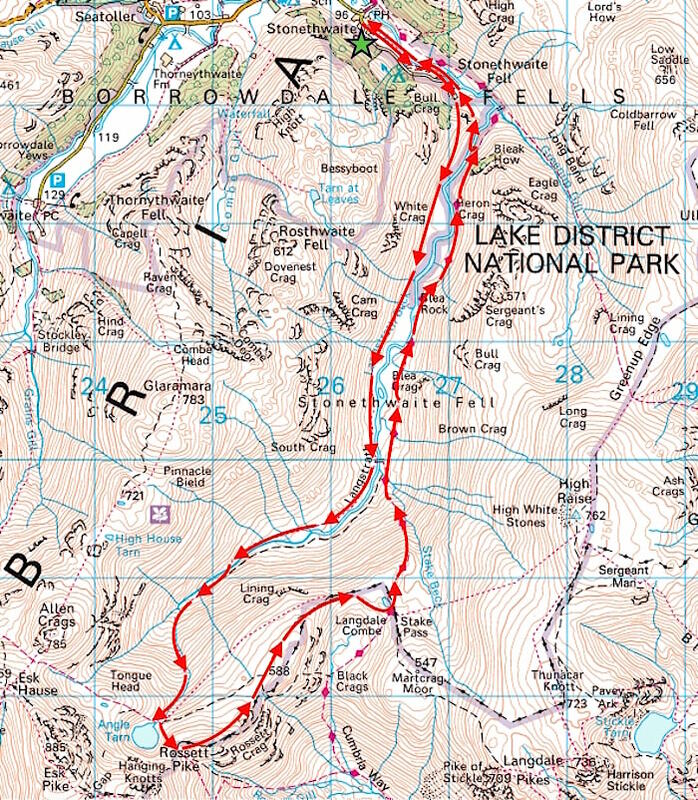 They didn’t have a map so we pointed out the route on ours, walked with them to the point at which our respective paths went their separate ways and then made sure they were on the right path over to Martcrag Moor and the Langdale Pikes. The young lass seemed to have more energy than the lad but then she wasn’t carrying anything. He was carrying the rucksack in the pockets of which I could see two one litre bottles of water. I hoped there were more bottles inside the pack as they still had a fair way to go and the lad was looking very hot and tired and lagged a good long way behind his companion. Once we were sure they were safely on their way we turned off down the Stake Pass path which would lead us back down into Langstrath. Thanks to the hot summer, there’s not much of a show in the waterfalls, and the best that Stake Beck could manage today was little more than a trickle. We treated ourselves to ice-creams from the quirky little shop on the way in to the village and I can highly recommend the blackcurrant flavour if you ever find yourselves in the vicinity. 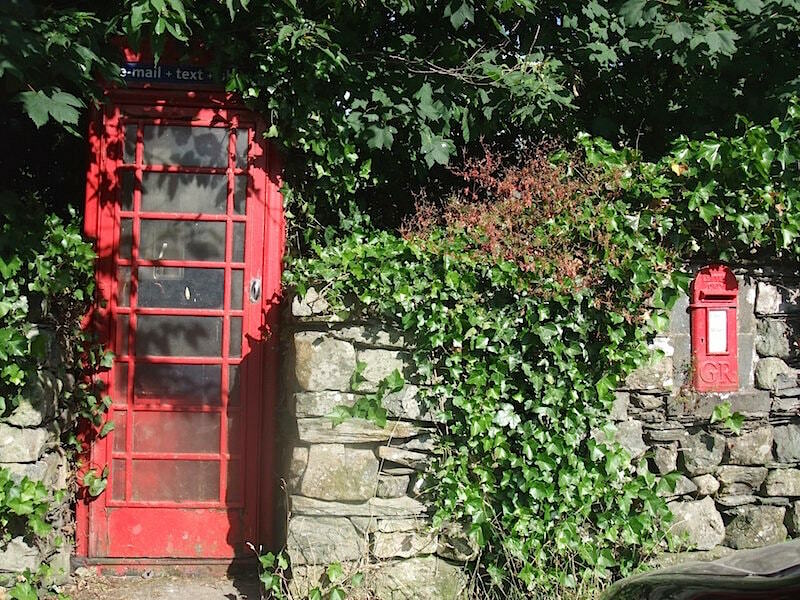 Back in Stonethwaite village itself and some street furniture from times gone by. The post box still showing the initials GR although it didn’t indicate whether it was V or Vl. The car is parked just out of shot on the left so its time to stow the pack, prise hot feet out of boots, sink into the car seats and just relax for a few minutes before the drive back. Great weather, great day.